The details are intricate and breath-taking. Did you know that in Costa Rica the Oxcart was declared National Symbol in 1968? It represents the peaceful tradition of Costa Rica and the arduous labor of its people. It was designed to be moved by two oxen and successfully pass through muddy places, hills, curves and mountains. At Dreams Las Mareas we honor that legacy with our own tribute, in the form of art! 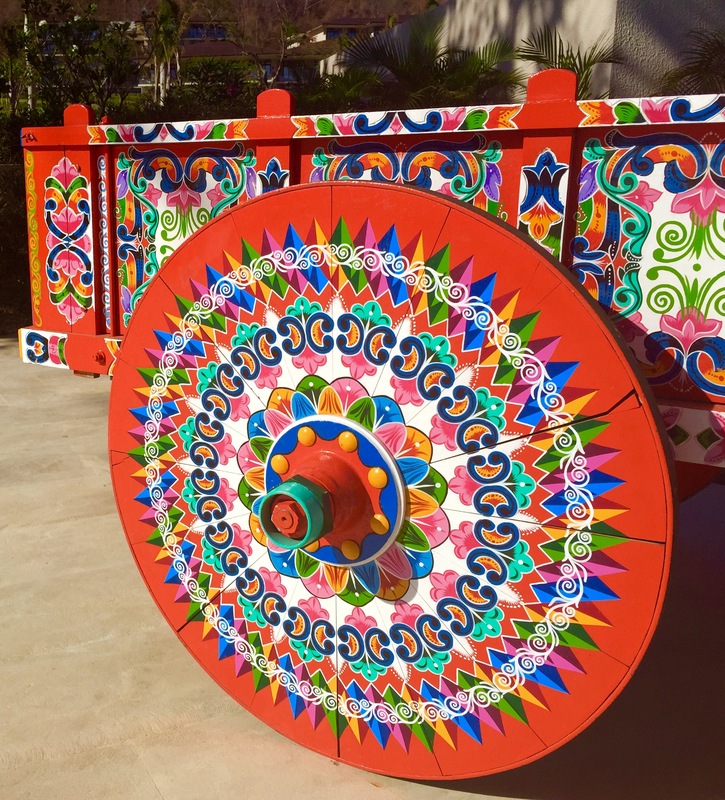 All the oxcarts are hand-painted with bright colors and geometrical figures. Many of them look alike, but you will never find two oxcarts painted the same. Nowadays, the oxcarts are mainly art, sold as a handcrafted piece that represents Costa Rica. You will find some during your stay at Dreams Las Mareas where you can leave your used pool towels to be picked up! Don’t forget to visit our souvenir shop and take a little reminder of the history and talent in Costa Rica! Have you seen these beautiful pieces during your stay at Dreams Las Mareas? Share your picture on Facebook and Twitter! This entry was posted in Dreams Las Mareas, Dreams Resorts & Spas and tagged Art, Costa Rica, Culture, Dreams Las Mareas, Dreams Resorts & Spas, History, Oxcart. Bookmark the permalink. ← Ready to Wed? Get Ready for the Destination Wedding of your Dreams!